Observation - Unknown Beetle - UK and Ireland. 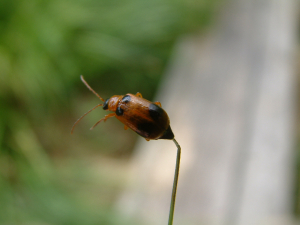 Description: Beetle on grass stem at Black Hole, Burton Pond, West Sussex. There is lowland heath around Burton Pond. Beetle on grass stem at Black Hole, Burton Pond, West Sussex. There is lowland heath around Burton Pond.